The Aerospike* in-memory NoSQL database running on the Intel® Xeon® processor E5-2600 v4 family is built to handle massive workloads cost-effectively. This operational Key Value Store has proven its ability to process terabytes of data and billions of transactions per day in mission-critical production environments. 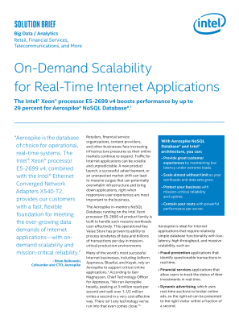 Aerospike can scale up or out on any number of Intel® Xeon® processor-based ...servers to address extreme latency, throughput, and data capacity requirements. All data can be held in memory to provide a combination of speed, scale, and reliability. Gain SDN and NFV benefits on open, flexible, and high-performance infrastructure for evolving demands. The Intel® Xeon® processor E5 family merges the I/O hub onto the processor for improved efficiency. New features and capabilities help improve performance, energy efficiency, and security. SAP HANA* & Intel® Optane™ DC Persistent Memory move more data closer to the processor for faster time to insights.